Blog of the Nashville Chapter of Tennessee Trails Association. Monthly Meeting: 4th Tuesday - 7 PM - REI Brentwood. Saturday, February 25, 2017. 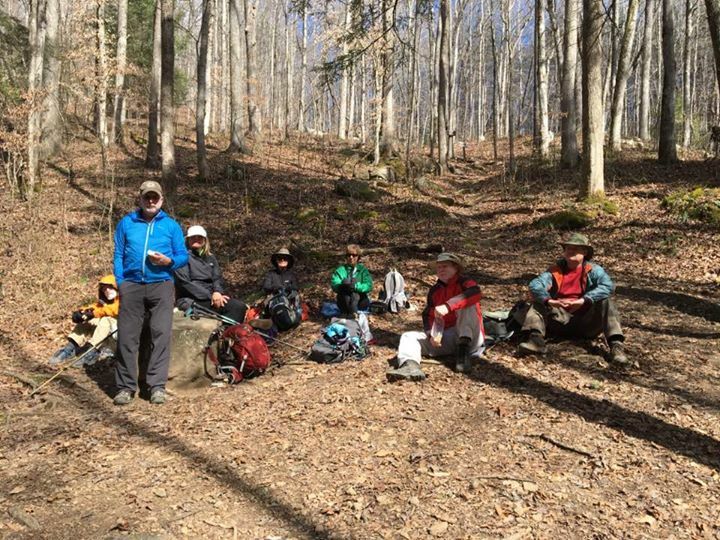 A co-led hike with the Highland Rim Chapter in the Virgin Falls State Natural Area near Sparta TN. 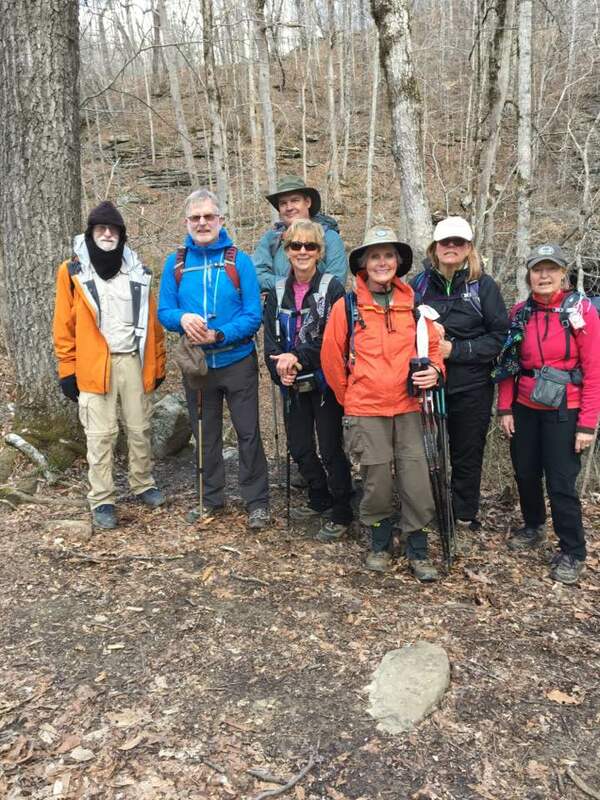 Eight hikers from 3 separate chapters enjoyed the sunny cool day, as did what looked like hundreds of other hikers. From the overflowing parking lot, we passed Big Laurel Falls, Sheep Cave Falls, and reached Virgin Falls in time for lunch. We took a side trail to the Caney Fork River on our hike back. It's always good to get back to Virgin Falls. Photos by Marietta Poteet. Wild Trees: What If the Last Wilderness Is Above Us? Written by actor Emilio Estevez for his father-actor Martin Sheen. Saturday, March 4 - Cheeks Bend Trail in the Duck River Complex State Natural Area (2 miles) followed by the Adeline Wilhoite River Trail in Henry Horton State Park, 3.5 miles.les, The Cheeks Bend trail will take us through a hardwood forest with river bluffs along the Duck River which is recognized world-wide and featured in National Geographic for its large array of plant and animal life. 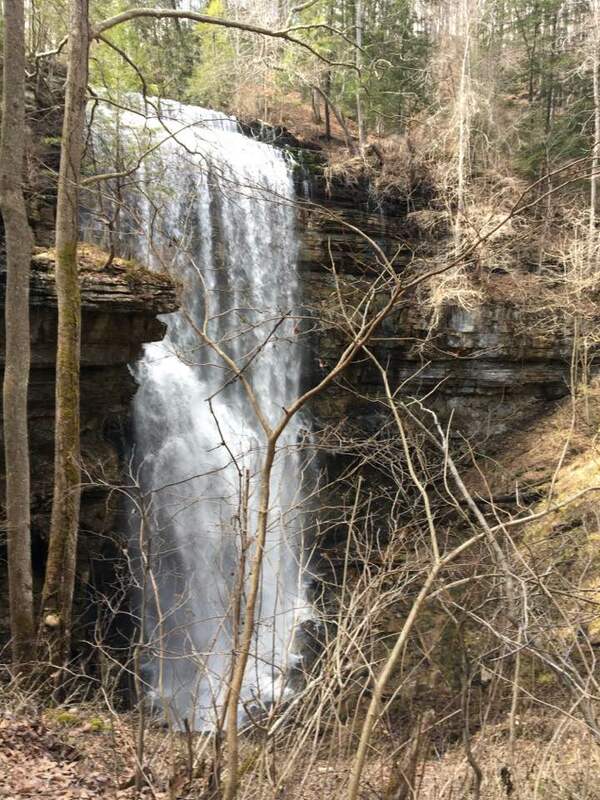 From there we'll travel to Henry Horton State Park - less than 30 minutes' drive - and hike the Adeline Wilhoite River Trail. Both trails are easy to moderate. For complete details and logistics contact Nora Beck, 615-17-6486 or norellibee@gmail.com. Saturday, March 11 - Walls of Jericho, near Winchester TN. 7-8 miles. strenuous. 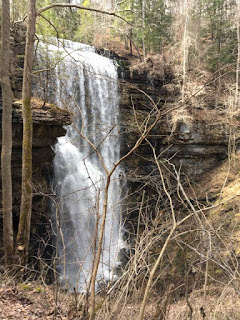 The Walls of Jericho is a 750-acre natural area that is within the 8,943-acre Bear Hollow Mountain Wildlife Management Area (WMA), which is contiguous to the Skyline WMA in Alabama. - The “Walls” is an impressive geological feature that forms a large bowl shaped amphitheater. Embedded in the limestone are bowling ball size holes from which water drips and spouts, creating a unique water feature. This amphitheater gives rise to steep 200-foot sheer rock walls that creates the natural feature defining the amphitheater. Turkey Creek drains through the “Walls” and has been an active geological force in creating the amphitheater. The forest land beyond the “Walls” feature is noteworthy with its many bluffs, large rock outcroppings, caves, and sinkholes. Descending steeply, the white-blazed trail (red on the Alabama side) crosses several creeks, streams, and horse paths on its way down to a skinny log bridge over Mill Creek. After passing a field clearing (a popular campsite area for overnighters) the trail continues on the south side of Turkey Creek on an often muddy and slippery path. At mile 3.7, you’ll reach the Walls of Jericho natural amphitheater. Call or email Karl Dupre at 615-207-2250, karld@comcast.net to register or for more information. Saturday, March 18 - Radnor Lake State Park, Nashville TN. 5-6 miles. moderate. 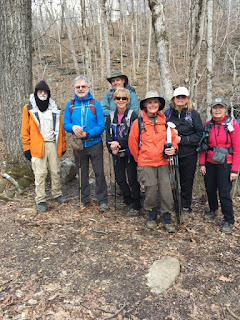 Meet at the entrance off Granny White Pike, hike along Lake Trail to Ganier Ridge, then across the road to South Cove and back to Granny White Pike entrance. Contact Betty Magee, (615) 319-5394, e-mail: monetfan455@yahoo.com. Saturday, March 25 - Ellington Agricultural Center, Nashville TN. 2 - 3 miles. Easy. There are creeks to play in if people want to wear sandals or water shoes. We'll start at Kathie Tange-Dupre's house, walk through the back yards in her neighborhood until we reach a bridge, then cross into the Ag Center. We'll walk most of the perimeter of the campus, go through the museum area and check out the gazebo. Start time 8:30. Contact Kathie Tange-Dupre at kathie.tange-dupre@bpsm.com or call/text at 615-512-1520 . Address is 5045 Briarwood Drive (Harding Place to Danby (south) to Briarwood – NOT from Edmonson). Tuesday, March 28: Program Meeting. 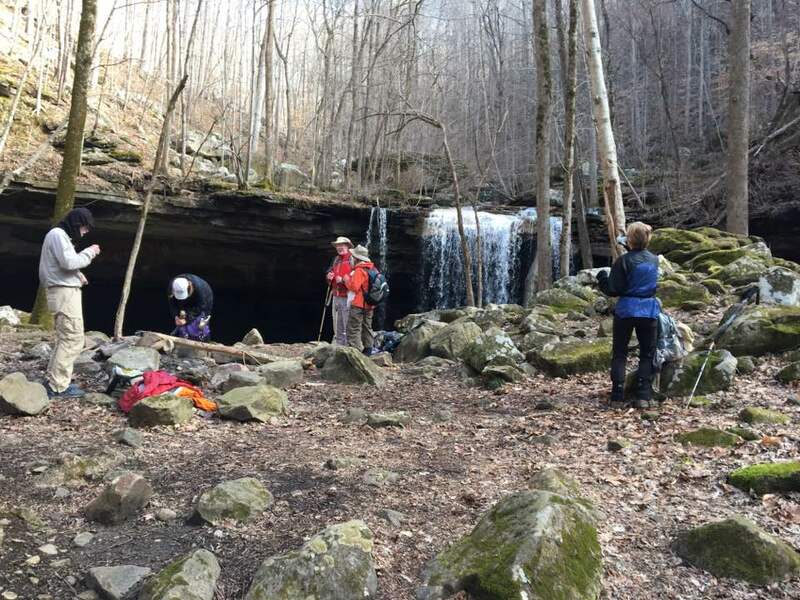 The Southeast Cave Conservancy,Inc. (SCCI) works actively to conserve subterranean treasures in six southeastern states. Fortunately, Tennessee is one of them. The group celebrated 25 years of conservation work in 2016 and now owns or leases 34 cave properties, protecting and preserving habitat for creatures that in many cases live nowhere else. SCCI’s executive director Ray Knott will be talking about this dynamic group’s mission and their work. Bring your friends!